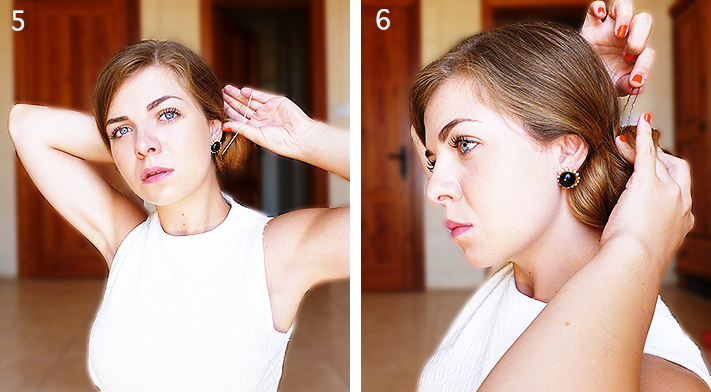 Today, I wanted to share with you a step by step tutorial to realise a simple side updo. I really love this hairstyle, especially when I’m seeking for something easy with a chic result. This hairstyle is fine for every situation, suits every type of face, and only takes 2 minutes of your time. Let’s go ! 1 – First of all, comb your hair well to avoid any knot. Part your hair on the side you prefer. I chose the left side. 2 – Put all of your hair on the side you chose and hold them in place. 3 – While you are still holding you hair on the side, slip it into the donut. Put the donut up until it is against your scalp, behind your ear. Be careful not to put it too high on your head because it would look silly. Try to keep it close to the nape of the neck. 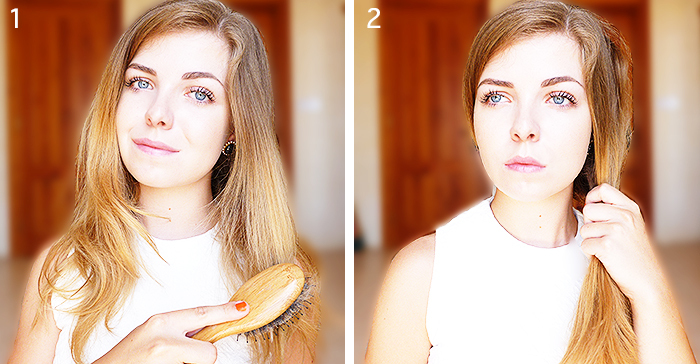 4 – Roll your hair around the donut to hide it. Hold the whole thing in place. 5 – Secure your hair and the donut with the hairband, like you would do for a ponytail. Don’t worry if the result is a little messy, we will fix that soon. 6 – Take your bobby pins and fix the donut on your head. Your updo must be held against your scalp, it shouldn’t fall. Use as many pins as you need and don’t hesitate to adjust some locks of hair to hide the hairband and the donut really well. 7 – Once your updo is secure, pull gently on some locks to give it more volume, like you would do to loosen a braid. 8 – If you want to, you can pull some locks of hair out around your face, and create some waves with a curler or straightener iron. Curling your hair with a straightener is simple : put the lock in the iron, twist it so that the lock rolls up around it, then slide the iron gently. 9 – And voilà ! Your hairstyle is done. If you have thin hair, don’t forget the hair spray to hold everything in place. I chose a loose finish for a romantic style. But, depending on the occasion, you can create a stricter result. You just need to be cautious during the steps 4 to 6 to roll the hair well around the donut. 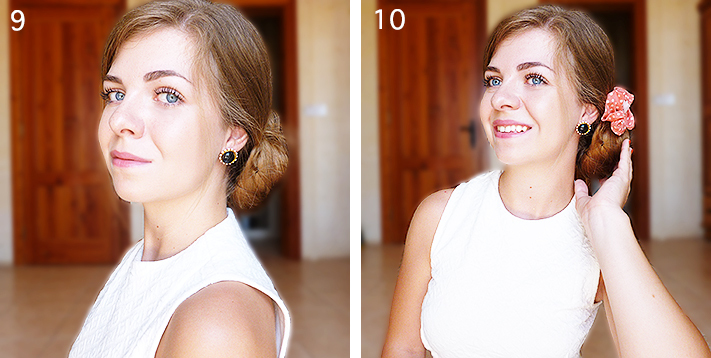 10 – Finally, if you want to, you can put an accessory above your side updo. I chose a dotted bow for a really cute result. You can also pin some fresh flowers in your hair, for a festival, a wedding, or a romantic dinner by the sea. I hope you enjoyed this tutorial, and that my explanations were clear enough. Don’t hesitate to ask me questions in the comments if there is something you don’t understand. Meanwhile, I leave you with this little selection of accessories to perfectly realise this hairstyle.